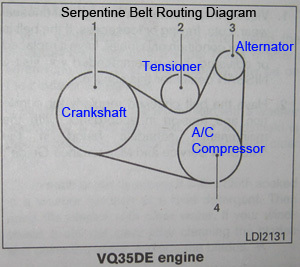 How to change the serpentine accessory belt on the VQ35DE 3.5L V6 engine in a 4th generation 2013-2016 Nissan Pathfinder. This automotive maintenance tutorial was specifically written to assist owners of the fourth generation (2013, 2014, 2015, 2016 and maybe also the face lifted 2017 model year) Nissan Pathfinder SUV equipped with the VQ35DE 3.5 liter V6 engine in changing the serpentine accessory belt. The OEM serpentine belt part number is Bando 7PK1035 (also known as Nissan # 11720-3WS0B or 117203WS0B). Two other compatible belts are the ACDelco 7K407 and the Bando 7PK1035A. The tools needed to replace the belt include a 3/8" drive ratchet and a flathead screwdriver. The first few steps are to park the SUV on a level surface, turn the steering wheel all the way to the right and turn off the ignition. Turning the front wheels all the way to the right will help create more working room in the front passenger side wheel well. For extra safety, engage the emergency / parking brake and place wheel chocks on both sides of the tires to prevent the vehicle from moving. Move to the front passenger side wheel and locate the black plastic wheel well liner or "splash guard" that will need to taken off in order to access the serpentine belt. Use a flathead screwdriver or a plastic pry bar tool to gently pull out the center part of the four pop rivet fasteners on the panel. Once the center part has been lifted out, pry out the base of each fastener. Set the four pop rivet fasteners and the plastic wheel well access cover aside in a safe place. Take a minute to examine how the OEM belt is routed around the various pulleys including the crankshaft, tensioner arm assembly, A/C (air conditioning) compressor and the alternator (A.K.A. "generator"). Locate the square shaped opening at the end of the belt tensioner arm. Insert the 3/8" drive head on the ratchet in to the square opening in the tensioner assembly arm. Firmly pull down the ratchet handle to release the tension on the old belt. Hold the wrench handle down with one hand while carefully slipping the old belt off the crankshaft pulley with the other hand. Check the old belt for cracks, frays or chunks of missing rubber. If the old belt is in relatively good condition, consider saving it in your trunk or garage as an emergency back up just in case the new belt fails prematurely. I recommend buying the Bando 7PK1035A serpentine accessory belt since Bando is the OEM (original equipment manufacturer) for Nissan. A good rule to remember when you are installing the new belt is that the ribbed side gets wrapped around ribbed pulleys and the smooth side goes against the smooth pulley. Begin by wrapping the ribbed side of the new belt around the large crankshaft pulley closer to the rear of the engine. Then wrap the belt around the A/C compressor pulley and over the alternator pulley. Pull the final loop of the new belt towards the tensioner pulley. Attach the 3/8" drive ratchet to the square opening in the tensioner arm. Firmly pull down the ratchet handle with one hand to release the tension and then carefully slip the new belt under the tensioner pulley. Double check that the new serpentine belt is properly routed and fully seated on the ribbed pulleys. Line up the wheel well liner panel and push in the re-insert the four pop rivets. Push in the center of each fastener to secure them in place. Start the engine and listen closely for any sounds that might indicate a problem such as an incorrectly routed belt, a worn out tensioner assembly or a seized pulley. Remember to record the belt change in your vehicle's service records.